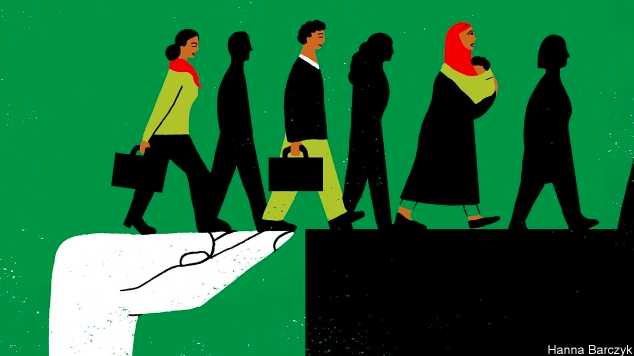 The Economist has written an interesting piece on the topic of migration entitled ‘Governments need better ways to manage migration‘ (content can be accessed but requires subscription). Aside from those people who would prefer their societies to remain homogenous, as they would always favour migration to be kept to a minimum, most others would accept migration and see it as a positive if the risk of disruption could be better managed. 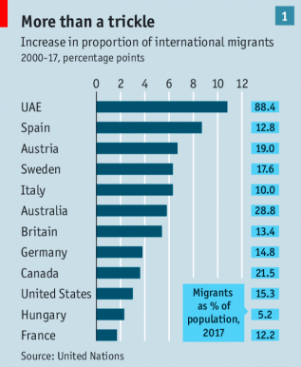 There are some very distinct approaches to migration as The Economist article suggests, whether in the UAE, Sweden or the USA. Interestingly also is the % of the population that are made up by migrants (as per table above) with the UK and Spain at a similar level at around 13% whilst Australia and Canada having a much higher share above 21%. The Economist article suggests that no country has a perfect system but four policies could help to maximise the benefits of immigration, minimise its cost and boost public support for it. This is because disorder fuels anti-immigrant sentiment and the opposite is also true as can be seen in Canada and Australia, which have a high immigrant population and yet public opinion is generally pro-migrant as they feel the government is in control of its borders. The next three suggested policies by The Economist are all about integration. This can vary greatly and as an example, the unemployment rate for immigrants in Sweden is 16% (better benefits and stronger unions restrict unskilled workers) whilst 4% in the USA (flexible labour market and meagre welfare state). There has to be a balance it seems between support by the state and the development of skills and push for migrants to work. Clearly no government or country will be able to support a high amount of migrants unless they can work and contribute to society. 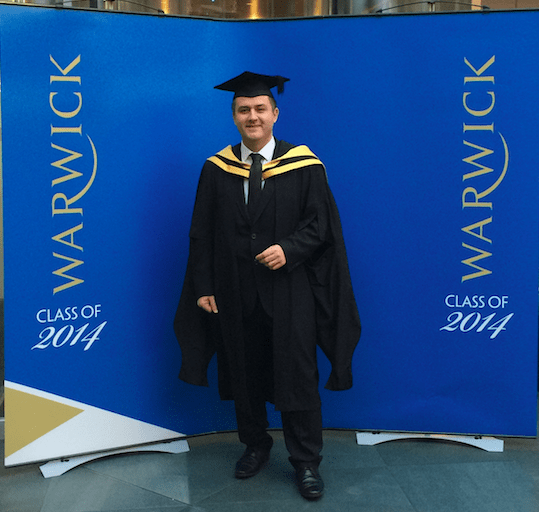 Below is a happy picture from 2014 when I receive my MBA after years of study and effort whilst working full-time, in order to develop my own skill set. From personal experience, language can be one of the main barriers or enablers to fitting in to the local society. This seems obvious but it is not always taken onboard by all immigrants. 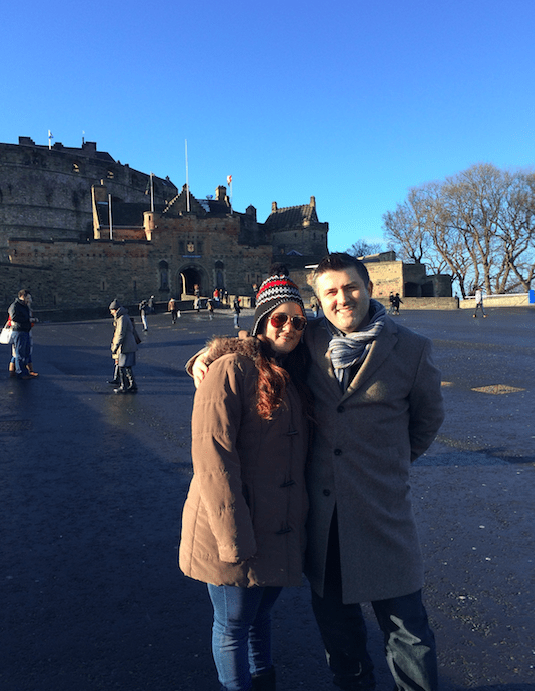 Fortunately for myself, I started learning english as a second language in Brazil, and yet nothing prepared me for the Scottish accent….or for the fact that my sister (pictured below near Stirling Castle) had the Scottish accent growing up in Dundee! Cultural assimilation can be a challenge, but as the article suggests, in America for example this is surprisingly quick with 60% of foreign-born Latinos speaking mostly Spanish and by the next generation this figure is down to 6%. After a few generations, most migrants and their families will also stop using ethnic labels (such as ‘hispanic’) and just identify themselves as American for example. Some of this assimilation will also involve the acceptance of the local customs, culture and beliefs – of course, this also involves bringing some of your own background to the overall mix and creating a more diverse and interesting society as a whole. However, personally I have never understood why some immigrants feel that a local celebration for example can be offensive to them, if that is the case, and you feel strongly enough, then I think it is time to migrate again…. I am an adopted immigrant of Scotland and have been living in the UK for over 27 years. 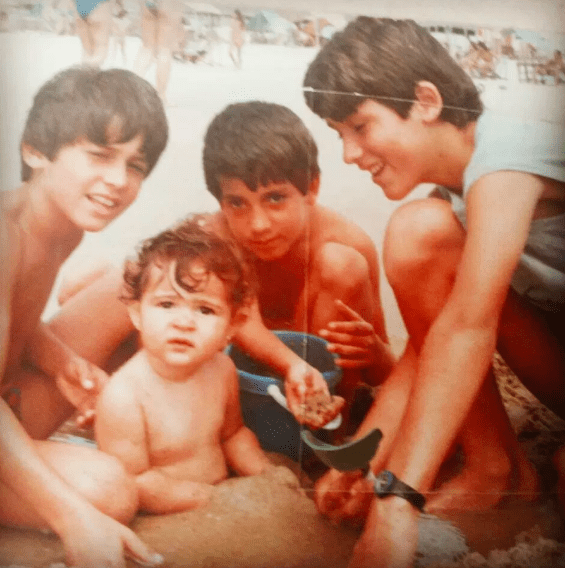 My family history is one of immigration from my father’s move from Portugal to Brazil at a young age to my own move from Brazil back to Europe and the decision to stay in Scotland. 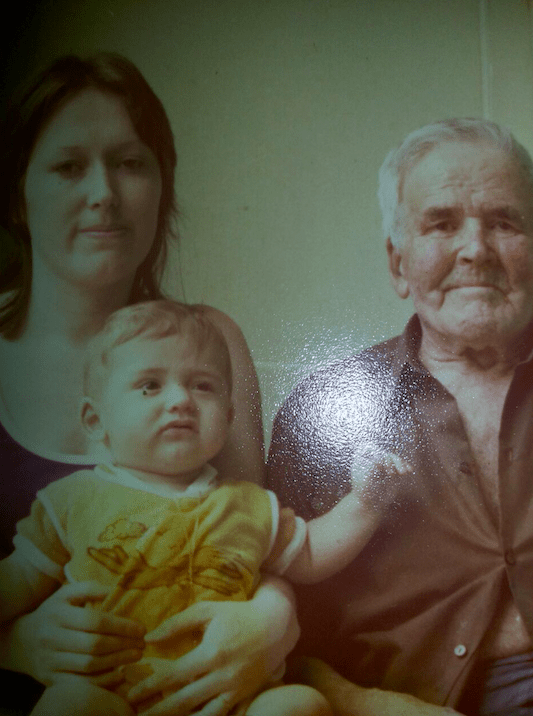 My family have the Portuguese surname (de Almeida) and Brazilian influence but are very much Scottish. Coincidentally, I now work for a company in the Scotch whisky industry (Loch Lomond Group) based 5 minutes from where my wife was born in the Vale of Leven Hospital in Alexandria, Scotland. 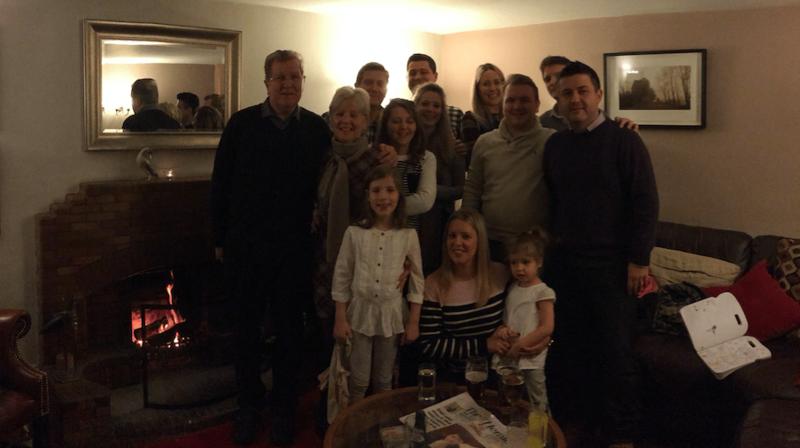 My wife’s family background is very much British/ Irish with relatives in Dumbarton, Helensburgh, etc in Scotland and also family in Ireland. Her relatives include her grand-father, Willie Gallagher who was a Scottish international marathon and cross country runner, and also his younger brother, her great uncle, the boxer Richard “Skeets” Gallagher from Renton, just over 2 miles away – for information on the ‘uncrowned flyweight champion of the world’ – click here. From an immigrant to an immigrant, totally agree with your point of view of knowing a local language and respecting local traditions of the country that accepted you – if you don’t like it, go somewhere else, as it’s not your home and these are not your rules. If you can’t respect the customs of the people who accepted you, then maybe you don’t deserve to be here. 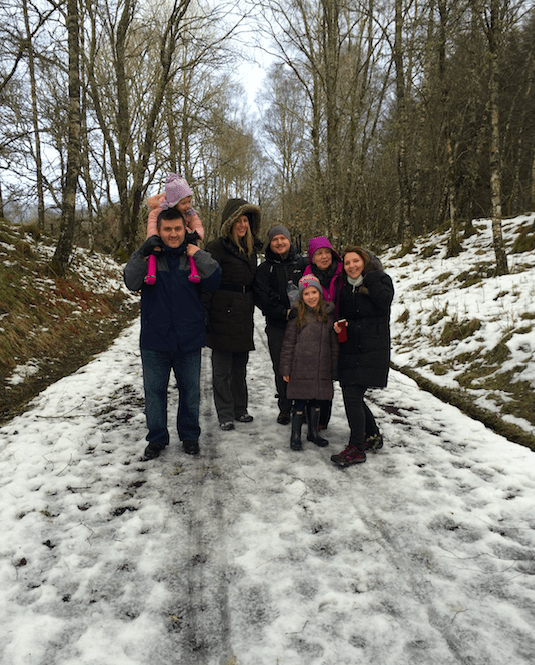 I am a Lithuanian love immigrant, I married a Scottish guy, and I have to say that the Scots accepted me and helped me to understand ins and outs of the Scottish culture and traditions, which I hold dear. I think in order to integrate and become a fully socially functioning and contributing member of the society you need to make first steps to show that you want it. I’m only for contributing immigrants as everybody can offer something.